Tony White sent us this press release about the Drawtastic aninmation festival to be held in West Seattle, USA. Definitely pencil this one into your diary folks! 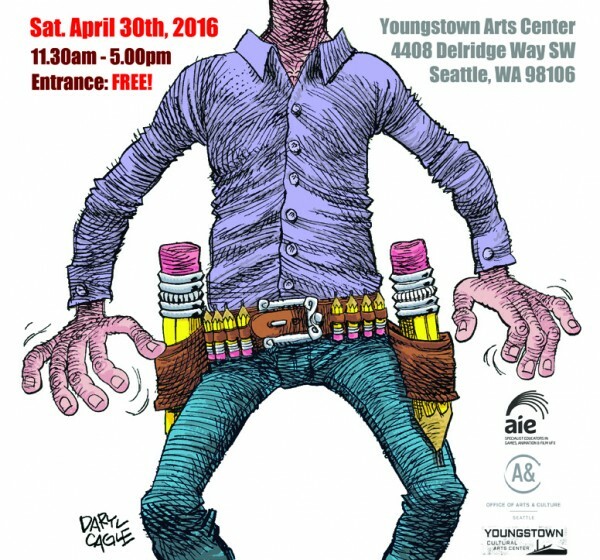 DRAWTASTIC is West Seattle’s new and exciting festival of drawing & animation. This festival is entirely unique as it pays special homage to the ‘humble pencil’ in our modern digital world. So much focus is given to today’s new technology that the poor old pencil has become undervalued, forgotten and even dismissed. However, those who know how our modern creative industries work, realize that most foundation work invariably begins with a pencil drawing – and sometimes throughout the whole process too! The organizers feel its time to put the pencil back on a pedestal where it belongs! To start this process, Artists, Animators and Vendors are working side-by-side with Workshop Presenters & Top Industry Professionals to share their love of the pencil with art, illustration and animation fans everywhere. Add that to the 62 amazing animated films from around the world that they will be showing on the day and you’ll see that this amounts to a pretty incredible event that totally defines ‘Pencil Power’ at its best! So why not join them for this day of art & animation magic? Bring the family too! Additional FREE fun events will include learning how to draw caricatures, or how to make animated flipbooks – as well as other spontaneous happenings! Last but not least, at the end of the day in the theater, the best animated films will be presented with their respected ‘Golden Pencil Awards’ after which, everyone will be able to chill out at their last ‘Meet ‘n Greet’ event of the day (purchased ticket required) where Artists, Animators, Presenters and Fans can hang out together and share their pencil stories!